I had mentioned that this Thanksgiving I took it easy in the kitchen. There was no time to fuss about with turkeys, sides or complicated dishes. I took the simple route and made only two things: the sweet potato, corn & jalapeño bisque and this crumb cake. It worked out perfectly because both the soup and this cake tasted deeply like autumn. And they were so easy to prepare that I could enjoy time with my guests and let the evening roll out easily. Simple pleasures, indeed. Made with lightly sauteed apples and bursting with cinnamon and spice, this cake is kept moist with the addition of pumpkin puree. The original recipe calls for 4 cups of apples and a 9 inch round pan. I made this in an 8 inch cake pan and was able to only add in half the amount of apples. Worried that my cake would spill over, I took the extra precaution of putting a baking sheet underneath, but everything worked out perfectly. No spills! The batter rose up high in the oven and fell quickly when I took out the cake to cool. It was dense and delicious and perfectly unfussy….and I’m sure if you were short on time & didn’t want to saute the apples, you’d still find yourself with a cake to be thankful for. 1. Preheat oven to 350F and butter up an 8 or 9 inch cake pan. Set aside. 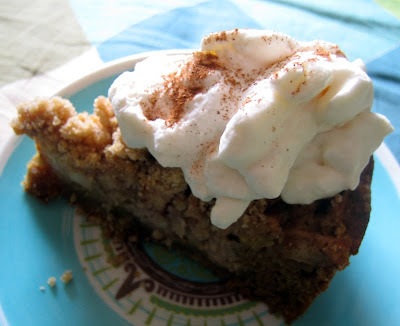 In a large skillet, heat butter and stir apples, sugar, cinnamon and nutmeg. Saute lightly for a few minutes until fragrant and the mixture starts to caramelize. Remove from heat. 2. Mix together the flour, salt, brown sugar, and spices. Cut in butter and use your hands to break up the mixture until it resembles coarse crumbs. Set aside 2/3 of a cup to use as crumble topping. 3. In another bowl, combine pumpkin, yogurt, sugar, baking soda and eggs. Stir in the flour mixture and beat until smooth. Pour batter into prepared cake pan. Spread diced apples over top and then sprinkle with reserved crumb topping. Bake for 1 hour and 10 minutes or until cake is golden and a cake tester comes out clean. Let cool on wire rack and serve with generous dollops of floppy maple whipped cream. thgat does look very yum indeed! love anything with cinnamon & spice. This looks amazing! I love anything that includes pumpkin but this is different. 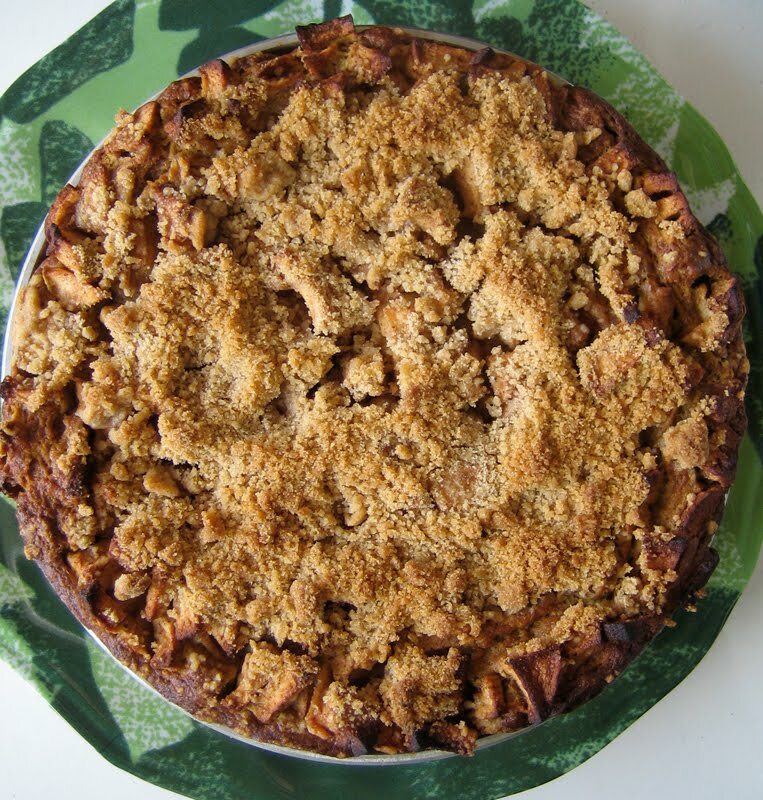 What timing – we just visited an apple orchard yesterday and I'm in need of some apple recipes. Guess what I'll be making this week? Oh, and I have all my ingredients for the sweet potato bisque. I'm ready. It's like Thanksgiving at your house all over again. That looks and sounds so yummy. The pumpkin would be a nice addition…I bet butternut squash puree would also be delicious in this recipe… I have made soup made with butternut and apples. Easy and delicious – my two favorite words. Hmm…let's see: dinner party tomorrow and I hadn't a clue regarding dessert. This looks amazing. Ahhhmaaazing. Definitely one to try this season. Thanks so much for it. whoa, that photo of the slice of cake with the whipped cream on top looks like heaven 🙂 I need to stock up on pumpkin, there are so many things I want to make with it! Happy (Belated) Thanksgiving! Sounds like you had a lovely, simple dinner. Just my style. Pumpkin and apple together sound just about perfect to me! I wish I could take it easy for our upcoming Thanksgiving but it is going to be an epic cook and bake-a-thon. I made this last night and it was absolutely incredible! That looks wonderful! I agree, simple is the best so you can enjoy your company and not be frantic in the kitchen. LOVE IT!! and easily converted to GFCF for my son… thanksgiving for sure! so beautiful!! perfect for the season – i'm trying this one! made this tonight with the help of my 2 year old!! she loved using her hands to mix everything and its oh so yummy!!! thanks for posting this!! Haha Amy, I love it! Hag, I love butternut and apple soup and you could most def sub in bsquash here. You can say that again, Tara! Dana, I would have preferred an epic dinner, but it was a busy weekend so this did nicely. Hooray, so glad you enjoyed it, five moves!! Glad I could inspire you to convert this, Dolores! Rhonda, so glad that you both had such a great time making and eating this! Mmm sauteed apples, pumpkin and crumbs! Perfect fall dessert. I made this tonight. Very good. I used leftover home cooked pumpkin. Used a 9" cake pan. It only took 50 minutes to bake. It is very moist and dense. I didn't have anything to top it with, but I think it would benefit from the addition of whipped cream. Lovely photos & love the title of your blog!